Yesterday was a really positive day :) And I was very active too! Yay! ...And now I don't know where to start! *lol* But anyway... I had a few lessons, including one exam in italian which was really easy. And in the evening I had, I think, the most interesting lesson so far over here in Paris. The cours is about France of Louis XIV, i.e. the Sun King, and this time the porfessor talked about the nobles and the court including why and how they built castles, their hobbies and amusements and also their clothing. And I love the professor! He's not stiff at all, but very relaxed and even makes jokes and tells us funny stories related to the historical facts he's lecturing about. Really a great personality! Then I also spent some time in the library looking for - believe it or not - a subject for my pro gradu! I know! It's crazy! I don't know where it came from, but I suddently decided I want to get it over with so I started thinking about possible subjects I could write about. And I did find one very interesting book that I've been reading a bit. I hope I find something in it. 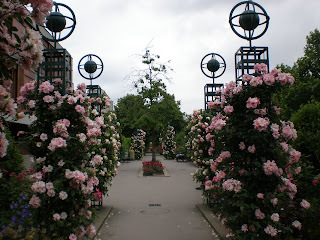 I also realized how many roses they have here in Paris. I mean, you find roses in almost every park! And in every different colour you can imagine! Oh, I love them! They're so very beautiful! I think I've already taken too many stupid pictures of beautiful roses I've seen while walking around in the city :D But I mean, look at it! 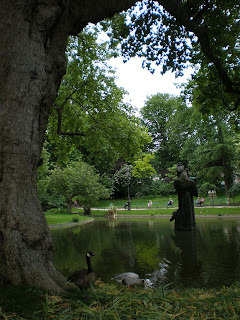 This photo is taken on the Promenade Plantée that I told you about earlier. This was the third time I went there and it looks different every time when more and more flowers start blooming. This time I actually walked the whole promenade, all the way to Bois de Vincennes. And I just love the name they've chosen for the band! Happy-Go-Lucky! How great isn't that?! :D And the music! So... positive! It makes me feel happy :) And that's what's important in music for me. To make you feel something. Especially to make you feel good. You know, I even have engraved on my iPod the following quote: "Music is what feelings sound like". It really is. Don't you think? And perhaps that's also the answer to the question why so many people love music and listen to it all the time. I mean, everyone do that! It's amazing. Not a single speach could capture the attention of people as well as music can. I'm so fascinated. Really. Wow.